You know what they say about assumptions, right? You make an #$@.. You get my point! 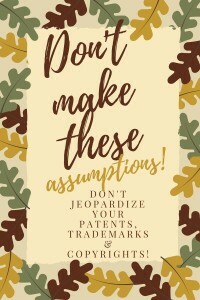 Well, keep reading so you don’t make assumptions that can jeopardize your patent, trademark or copyright rights. First, there’s no percent rule! Congratulations on your invention but never ask a patent attorney, what percent you need to change an invention to get a patent. The standard to get a patent is that the invention needs to be useful and solve a problem, the invention needs to be novel and the invention needs to be non-obvious. Have you searched high and low for your invention in every store and you can’t seem to find it on the shelves? Don’t assume that if you haven’t seen your invention in the store, you can patent it. Some inventions are patented but never manufactured and sold. It’s best to seek the help of a patent attorney to conduct a search to determine if your invention is patentable. Don’t assume that if you own a domain name, you own a trademark and vice versa. If the domain name is used as an address rather than a source identifier, the domain name doesn’t function as a trademark. Be careful sending out cease and desist letters to third parties! First, don’t assume that if someone is using your trademark that their use is improper. Also, don’t assume that you have senior rights over their use. It’s best to seek the help of a qualified trademark attorney to research the potential infringement and strength of your trademark. Are you copying and pasting pictures from the internet? Are you assuming that if the image is on the internet it’s free to use? You may be liable for copyright infringement. This applies to text on the internet. Even if credit is given to a third party for their content, you can be liable for infringement. It’s better to ask for permission or license the content. What are some other common assumptions inventors and entrepreneurs make?